This game is more or less "Castlevania SMS," which is why I love it so much. Everything in this game, including the villain, is analogous to Castlevania (save maybe the difficulty), so I'm going to be making a lot of comparisons in this review. The following is why I think this game is so awesome. 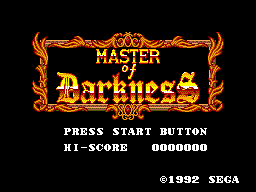 The same classic platforming action as Castlevania, you jump gaps and attack enemies while whipping masks (like candles) to pick up sub-weapons and other power-ups. Here, you use a knife instead of a whip, which can be upgraded to a rapier, axe, or cane (at least I think it's a cane); but unlike Castlevania you can downgrade your weapon, as some masks could contain weaker weapons than the one you're using. There are four sub-weapons, all analogous to the sub-weapons in Castlevania. Sub-weapons include: the gun, the bomb (holy-water plus the axe), the boomerang, and the spike (dagger) which oddly enough does the most damage. The game is a little bit longer than Castlevania, as it is broken into five chapter, with three rounds in the first four, and one the last. 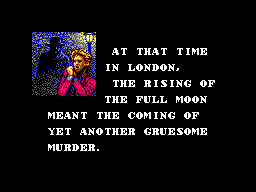 At the end of each chapter you fight a boss, then get some cuts-scene with text, that advance the story (clearly the game's creators were influenced Bram Stoker's famous novel). My only gripe is that the game is it can be too easy, especially with continues unlike many SMS games (though this is an improvement over the balls-to-the-wall difficulty in Castlevania). The graphic are great! the sprites have a lot of detail to them and there is a good amount animation, something that is lacking in many SMS titles. Also, there is a minimal amount flicker, another thing that is rare for SMS games. Honestly, I would go so far as to put them up there the graphics in Sonic Chaos and The Ottifants. The music in this game is classic! and classically inspired very comparable to the music in Castlevania. Another thing about the music is that it is in tune, unlike some SMS games (I'm looking at you My Hero). I know the SMS isn't known its great music, but I'd put this game and Psycho Fox up against anything on the NES. Very fluid (unlike Castlevania), they respond with almost-exact precision, this is a game that anyone regardless of age or experience can pick up and play. 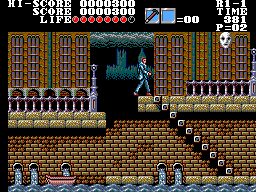 Unlike in Castlevania you have control over your jumps, making the platforming feel very intuitive. Usually high, even once you've beaten it and seen the ending (which is very satisfying BTW) it's still fun to sit down and play through it for 45 minutes. There is also a hidden options menu where you can change the number of lives and other variables which add to the replay value. It's a shame this game never got a proper release in the US (though it was released on Game Gear), because in my opinion it's better than Castlevania, and I own all three NES games, and I wouldn't have had to pay international shipping on it. It seems Sega could've at least made a sequel to it for the Genesis like they did with other exceptional SMS titles. With the said, if you own a Master System you owe it yourself to pick up this game. Even if you're fairly new to the system and grew up with NES like myself you should get this game! the $20-30 US you'll spend on it are well worth it.